Shift the emphasis from the server to the client. My conviction is that GraphQL, a query language invented by Facebook, is a great candidate. This conviction is based on several months of development with GraphQL, and is shared by many developers at Marmelab. I'll explain what GraphQL is in this post. But first, let's bust a few misconceptions about GraphQL. First and foremost, GraphQL is not a query language for graph databases. That would be Gremlin. There is a concept of graph in GraphQL, but learners don't understand it until they're halfway through the docs (and I'll explain it in the next post). In the meantime, many curious developers give up, thinking this doesn't concern them if they use a relational or a document database. So in my opinion, GraphQL's biggest flaw is its name. Any other name would have been better, like, why not, "Caramel". Not that it can't happen to anybody else: I named "admin-on-rest" a React library that can work with any REST or GraphQL backend. So let's make that clear: GraphQL works with any database - relational, key/value store, document, and graph. You can even use it in front of a REST API. GraphQL is not a transport protocol. You can use GraphQL with any transport - HTTP, WebSockets, you can even send GraphQL queries as text files by Bittorrent if you feel like. That makes it different from REST, which is tied to the HTTP protocol, and built on the HTTP grammar (GET, POST, PUT, etc.). Following on from that idea, GraphQL doesn't deal with authentication, authorization, compression, caching, content negotiation, etc. That's your responsibility. GraphQL intentionally doesn’t include built-in filtering, sorting, computations, or joins. You carefully design all of those yourself to fit the needs of the API consumer, just like REST. Just like REST, the body of a GraphQL response is a JSON object. However, the format of the response is normalized, and the content is always available under a data key. In GraphQL, parameters are passed between parentheses (here: (id: 123)) and inside the query. In REST, you ask for a complete resource, while in GraphQL, you have to explicitly list the fields you want (id, body, and date in this example). GraphQL queries use a special query language called... graphql. It looks like JSON but not really. We'll see that very soon. Unlike REST, GraphQL isn't tied to HTTP semantics. To read a resource, GraphQL uses a POST HTTP request. If you feel shocked, please bear with me. In a few minutes, you'll see how great an idea that is. So yes, GraphQL servers usually don't care about the HTTP verb. It's more common to use POST for everything (read and write queries) because it's more readable in tutorials. As explained earlier, you don't even have to use HTTP at all to communicate with a GraphQL server. As a side note, you can see with the GET request that newlines and tabulations aren't significant in graphql queries. Tweet and Tweets are query names, defined by the server. As a matter of fact, GraphQL is at its core a Remote Procedure Call (RPC) language: it lets the client call procedures (queries) on the server. That means it's absolutely not limited to CRUD (Create, Retrieve, Update, Delete) scenarios. I should warn you though: There is no convention for naming queries. Some GraphQL servers will use Tweets for a list of tweets, others may use allTweets, others getTweetPage, etc. I know that naming things is one of the two hard things in computer science, but I still regret that the GraphQL spec didn't take a step further. In addition to the Tweets, I called the User query to get the details about the connected user, and the NotificationsMeta query to get the number of pending notifications. GraphQL lets me aggregate several queries into one HTTP request. So GraphQL allows you to group many queries into one, including queries for related resources. That way, you can always get all the data you need for a screen in a single request. Indeed, the last query is enough to render the entire Twitter home page in one roundtrip. Mission accomplished! If you're wondering how a GraphQL server works, the third post in this series will answer your questions. It's a tutorial for building a GraphQL server for a Twitter app. For now, please consider that the server already exists, and free your mind from these server-side considerations. Wait, how did I know that I could call the Tweets, User, and NotificationsMeta queries on the server? I mean, apart from the fact that I'm actually writing this tutorial? To put it otherwise, how do I, a frontend developer, know which queries, and which fields in each query, I can call on a GraphQL backend? # The tweet text. No more than 140 characters! Each of these entry points have a return type, and the schema lists the available fields for all these types. So for instance, the Tweets query returns a list of records of the Tweet type, which exposes id, body, date, Author, and Stats fields. These fields are also typed, either with a scalar type (Int, String, or ID, which is like a String), or with a custom type (User and Stat), for which I can also see the available fields. A GraphQL schema is like the Swagger of REST APIs. It contains all you need to know to interact with the server. In practice, and unlike in this article, development in GraphQL is schema-first. Frontend and backend developers start by agreeing on a schema. They define the contract between the frontend and the backend. Then, each team develops their own part, without any surprise. You'll see how that works in the next post in this series. Note: GraphQL recommends using the ID type for primary keys. That means that GraphQL expects record to be identified by a string. This also explains why, in the GraphQL results above, the Tweet.id field has string values even though the values are numeric. Note: You may have noticed the scalar Date declaration. It's a type declaration that most schemas contain, because the GraphQL specification doesn't define a Date type by default! GraphQL provides built-in scalar types for String, Int, Float, Boolean, and ID. Object fields can have parameters (as in the Notifications query), inside parentheses. These parameters have types, too. The schema doesn't explain how the server fetches the result, it describes what the result should look like. In that sense, the graphql language is, just like SQL, a declarative language. But unlike SQL, a GraphQL request and response are very much lookalike - you always know what to expect. With GraphQL, I'm sure of what the response contains, regardless of the technology used to implement the GraphQL server. I started appreciating this advantage after my first GraphQL project, when I understood that all I had learned on the first project was directly applicable to the second one. If you feel that repeating the list of fields you want in every query is cumbersome, check out GraphQL fragments - they're kind of like macros. A GraphQL query can only contain one of the three keywords query, mutation, and subscription. That means you can't aggregate read and write operations in a single query. Note: GraphQL doesn't specify the transport to use for the realtime subscriptions. It's usually WebSockets, but you can use iOS push notifications, long polling, or even email! This will come in handy when debugging GraphQL on the client side, as debug tools list the queries made by the client by name. To build such a query, I have to concatenate or interpolate a value (123) into a string. This opens the path to injection attacks - not SQL injection, but GraphQL injection. To make this query safe, I can transform the 123 value into a $id variable, and tell GraphQL to bind the 123 value to this variable. If this sounds like prepared statements in SQL, that's on purpose. Now the query is safe from injection attacks. In addition to allowing reusability of queries, graphql variables facilitate cumbersome String interpolation and escaping. 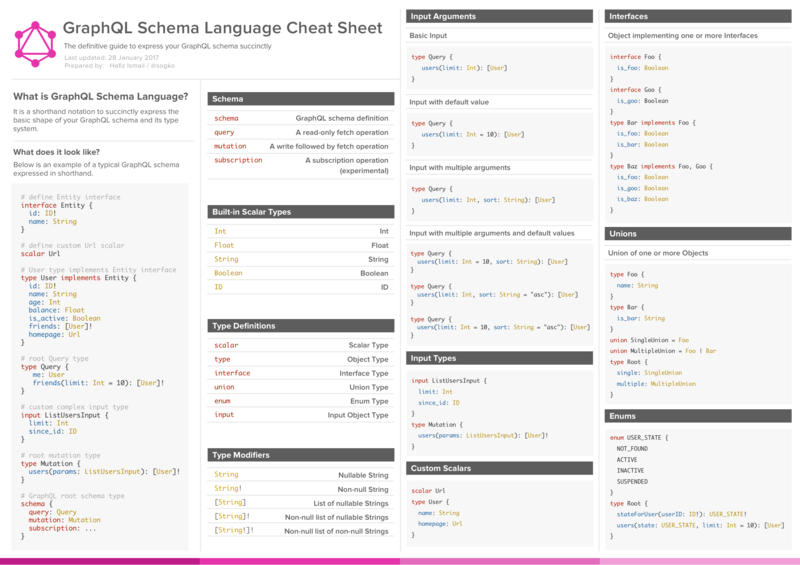 If you're looking for a way to remember the GraphQL syntax, I recommend the GraphQL cheat sheet by Hafiz Ismail. At that point, developers often wonder: Okay, GraphQL is a language, but how does that translate into my software architecture? Basically, a GraphQL server is an API gateway, a proxy between clients and a backend server. The backend server can be anything (REST API, relational database, NoSQL database). You can even use several backends and hide them behind a single GraphQL (proxy) server. There is also usually a small GraphQL SDK sitting on the client side, helping to build requests and decode responses. This is entirely optional, but that's the advantage of using a standard: you don't have to rewrite the code for every project. So GraphQL is a "query language", just like HTTP verbs and resource URLs are the "query language" of REST. But this language is much more developed and standardized than REST. GraphQL is an API gateway, or a proxy server that sits in front of data backends. GraphQL is a declarative query language. Clients get what they ask for. GraphQL is designed for Remote Procedure Call, and not limited to CRUD. GraphQL is a strong, statically typed language. It makes development faster and less error-prone. GraphQL moves the center of gravity towards the client. The client decides what fields they get in the response, not the server. GraphQL does not care about the backend storage. You can keep your database, you can even keep your REST API if it's still used. All in all, GraphQL is not the next REST, it's the next SOAP, redesigned from the ground up with the most important lesson learned from REST: simplicity. And I believe it's a great idea. Okay, you've read enough about what GraphQL is. It's time to develop with GraphQL, for real. In the next post of this series, I'll teach you to develop a GraphQL server in Node.js for a Twitter-like mobile app.